chinookmabb | | Chinook Mergers, Acquisitions and Business Brokerage Ltd.
For example, one person who runs a boutique mergers and acquisitions business refuses to take assignments from business owners over the age of 70. He has found that septuagenarians are so personally invested that they can rarely bring themselves to sell their business – frequently calling off the sale halfway through, claiming they just wouldn’t know what to do with themselves if it closed. While it’s always dangerous to generalize – especially based on something as touchy as age – a few patterns emerged in the research for Built to Sell: Creating a Business That Can Thrive Without You. Twenty- and thirty-something business owners grew up in an age when job security did not exist. They watched as their parents got downsized or packaged off into early retirement, and that resulted in a somewhat jaded attitude towards the role of a business in society. Business owners in their twenties and thirties generally see their companies as a means to an end, and most expect to sell in the next 5 to 10 years. To many boomers, the idea of selling their company feels like selling out their employees and their community. That’s why so many chief executive officers in their fifties and sixties are torn: they know they need to sell to fund their retirement, but they agonize over where that will leave their loyal employees. Older business owners grew up in a time when hobbies were impractical and discouraged. You went to work while your wife tended to the kids (today, more than half of businesses are started by women, but those were different times), you ate dinner, you watched the news and you went to bed. Of course, there will always be exceptions to general rules of thumb, but frequently – more than your industry, nationality, marital status or educational background – your birth certificate defines your exit plan. The Value Builder System and Certified Value Builder are Trademarks of Built to Sell Inc.
For many, June is a time to take a vacation, as well as a time to reflect on this year’s achievements and set goals for the year ahead. Write down at least one process per month. You know you need to document your systems, but you may be overwhelmed by the task of taking what’s inside your head and putting it down in writing for others to follow. Resolve to document one system a month and by the end of the year, you’ll own a more sellable company. 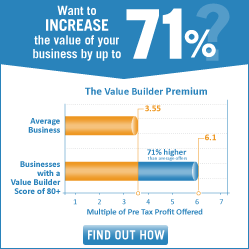 Get your Value Builder Score. All goals start with a benchmark of where you’re at today, and by understanding your company’s Value Builder Score, you can pinpoint how you’re doing now and which areas of your business are dragging down your company’s value. A lot of company owners will set resolutions around their revenue or profits for the year ahead, but those goals are blunt instruments. Instead of just building a bigger company, also consider making this the year you build a more valuable one. Credit: Built to Sell Inc. Diversification is a sound financial planning strategy, but does it work for company building? How does Vitamix get away with charging $700 for a blender when reputable companies like Cuisinart and Breville make blenders for less than half the price? It’s because Vitamix does just one thing, and they do it better than anyone else. WhatsApp was just a messaging platform before Facebook acquired them for $19 billion US. Go Pro makes the best helmet mounted video cameras in the world. These companies stand out because they poured all of their limited resources into one big bet. The typical business school of thought is to diversify and cross sell your way to a “safe” business with a balanced portfolio of products – so when one product category tanks, another line of your business will hopefully boom. But the problem with selling too many things – especially for a young company – is that you water down everything you do to the point of mediocrity. that are 42 percent higher than the average business. without gobs of equity-diluting outside money. engine with its endearing two search choices “I’m feeling lucky” vs.
but do we love them quite as much? up your time to think more about the big picture. attractive to an acquirer when the time comes to sell your business. Acquirers buy things they cannot easily replicate themselves. Go Pro (NASDAQ: GPRO) is rumoured to be a takeover target for a consumer electronics manufacturer or a content company that wants a beachhead in the action sports video market. Most consumer electronics companies could manufacturer their own helmet mounted cameras, but Go Pro is so far out in front of their competitors – they are the #1 brand channel on You Tube – that it would be easier to just buy the company rather than trying to claw market share away from a leader with such a dominant head start. comes to your business, it may be a sure-fire road to mediocrity. You may be years away from selling your business, but it’s never too early to understand what the process involves. If you have ever promised your child a treat in return for good behavior, you know all about negotiating leverage. When selling an attractive business, you also have leverage—but only up to the point where you sign a letter of intent (LOI). An LOI almost always includes a “no shop” clause requiring you to terminate discussions with other potential buyers while your suitor does due diligence. After you sign the LOI, however, the balance of power in the negotiation swings heavily in favor of the buyer, who can then take their time investigating your company. At the same time, with each passing day, you will likely become more committed to selling your business. Savvy buyers know this and can drag out due diligence for months, coming up with things that justify lowering their offer price or demanding better terms. With your leverage diminished and other suitors sidelined, you are left with the unattractive options of either accepting the inferior terms or walking away. Make sure your customer contracts have “successor” clauses. Have customers sign long-term, standardized contracts, including a clause stating that the obligations of the contract survive any change in company ownership. Nurture and prepare a group of 10 to 15 “referenceable” customers. Acquirers will want to ask your customers why they do business with you and not your competitors. Before you sign the LOI, cultivate a group of customers to act as references. Ensure your management team is on the same page. During due diligence, acquirers will want to interview your managers without you in the room. They want to find out if everyone in your company is pulling in the same direction. Consider getting audited financials. An acquirer will have more confidence in your numbers and will perceive less risk if your books are audited by a recognized accounting firm. Disclose the risks up front. Every company has some risk factors. Disclose any legal or accounting hiccups before you sign the LOI. Negotiate down the due diligence period. Most acquirers will ask for a period of 60 or 90 days to complete their due diligence. You may be able to negotiate this down to 45 days—perhaps even 30 with some financial buyers. If nothing else, you’ll alert the acquirer to the fact that you’re not willing to see the diligence drag out past the agreed-to close date. Make it clear others are at the table. Explain that, while you think the acquirer’s offer is the strongest and you intend to honor the “no shop” agreement, there are other interested parties at the table. If you take all seven of these steps, you will protect the value of your business as the balance of power in the negotiations to sell your company swings from you to the buyer.